… It was everywhere! And, because I love it so, it was not easy not bringing literal tons of this stuff home with me. I mean, get into the rugged good looks of all this stuff. I was dazzled by all the corrosion, rust, layers of chipped paint, scratches and gouges everywhere … Sweet dreams are made of these. I loved these big chunks of wood, too. 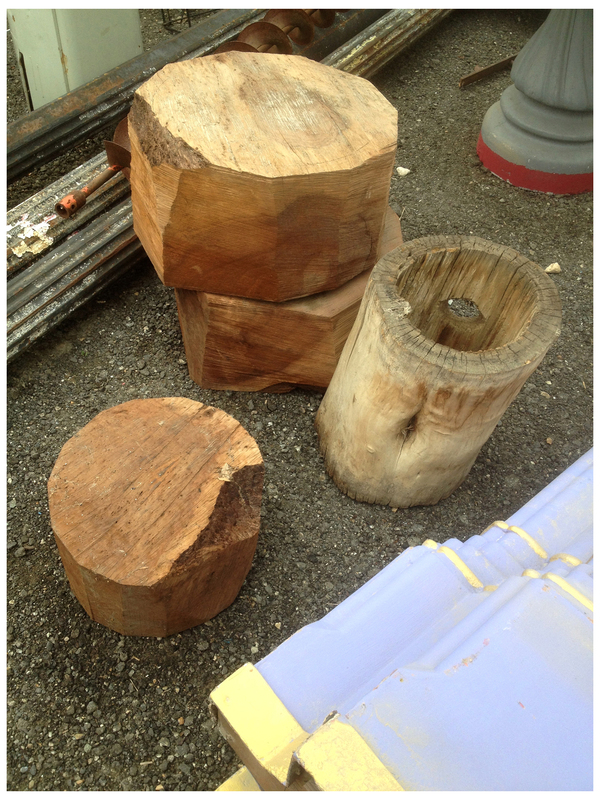 The faceted ones could be stacked as low tables and the hollowed ones would easily make nice rustic planters. Again, I surprised myself by not dragging some of these home with me. I was fond of these colorful tile-topped metal tables and chairs, too. 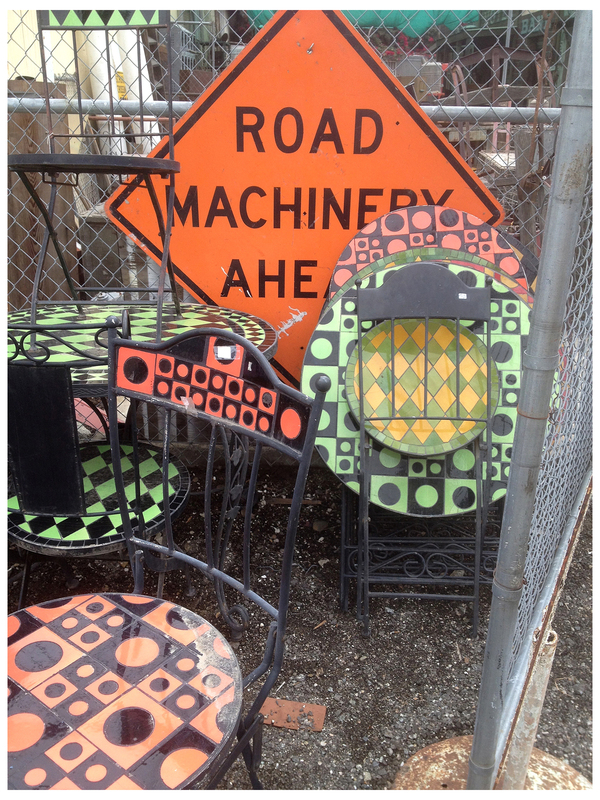 Orange and green, in circles and jazzy diagonals, these would add verve to a small patio space. 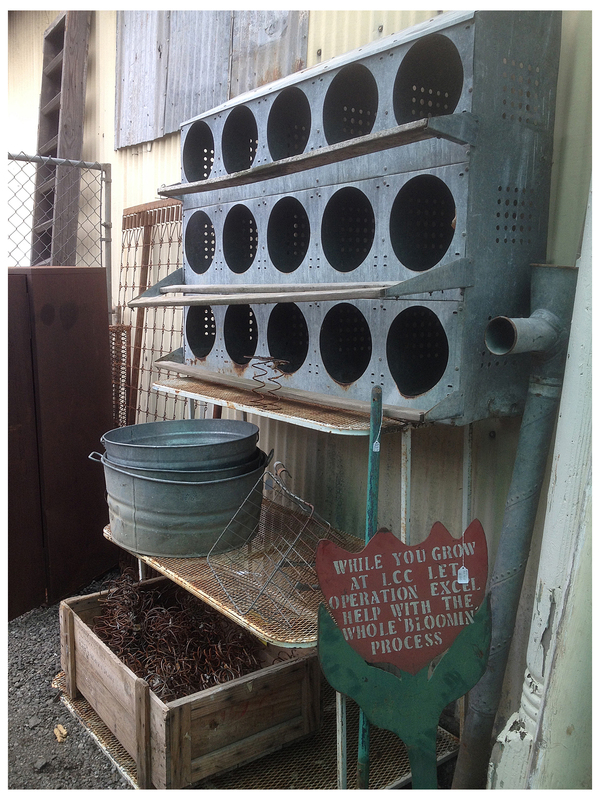 This amazing vintage chicken coop was also speaking to me. The galvanized metal, the repeated circle openings, the side vents, the built-in wooden perches; this, for me, is industrial design perfection! 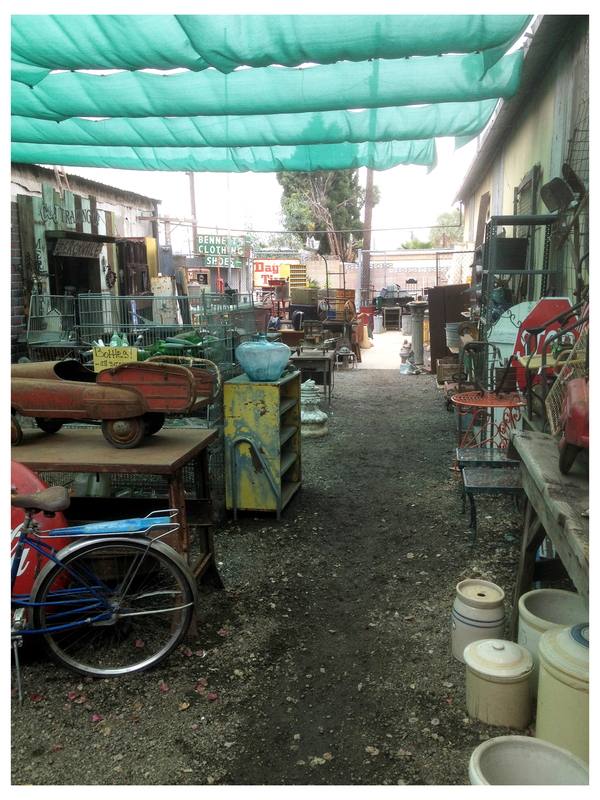 Treasure, junk, and lots more is everywhere here. All of it is raw material for the intrepid, creative and clever DIY gardener/designer. Whether you’re interested in restoration, or enjoying them as-is, TNJ’s got some really nice vintage kiddie cars. In search of something bigger? How about a full-size vintage taxi. Vickie, Tom, you out there? 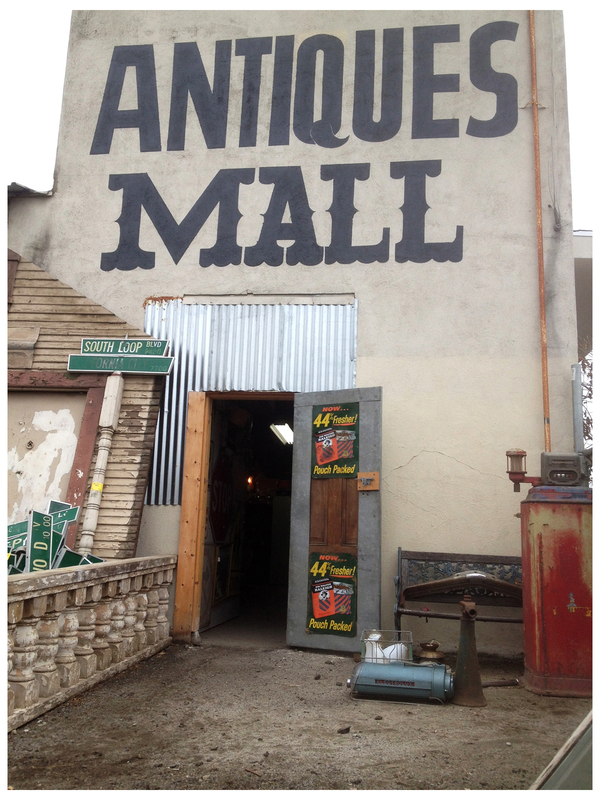 Of course, no antiques emporium worth its title is not without its oddities. We both loved the giant fly welded to a car door/surfboard; I loved Our Lady’s matching glitter bowling ball. This is the view of the original outdoor area from the main building’s inner hallway … it now extends well beyond all sides of the TNJ compound of buildings. It’s safe to say I only shot a fraction of what they’ve got available right now. I can’t wait to return; here’s hoping that some of my fave items are still available then! Omg I love this! Thanks so much I have to go there! I’ve been wanting to find such a place for sometime. What treasures! So now I’m looking forward to talking Tom into taking a ride out there. But then again, do we really “need” more such stuff around here? You betcha! This place is some kind of wonderful! It just needs to be closer to me. How you resisted not filling a truck with treasures I’ll never know. Were you taking some sort of cold medication? Love this stuff! I agree, the prices are pretty fair, Loree … I’m thinking I better get back there real soon if I’m going to get any of those columns! My heart won’t stop going pitter patter! I just might be taking a trip out there on Monday since I have the day off. The problem is, I don’t have a lot of money to spend since I just remodeled my bedroom and I’m going to my favorite vintage stores in DHS and Cathedral city on Saturday to look for lamp shades and a dresser. But still, a girl can look, right? !